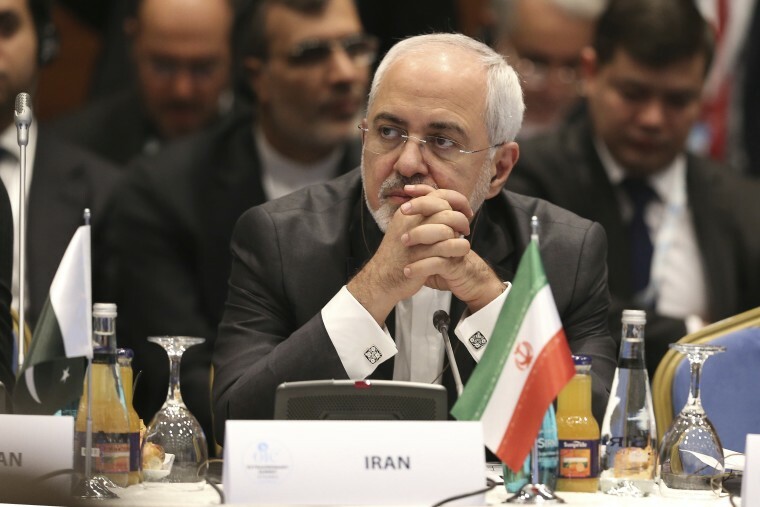 "There is no way that Iran would do a one-sided implementation of the agreement," Zarif said. But Mohammad Javad Zarif said that if that happens "we don’t intend to get a bomb," and said that “Iran never raced towards a bomb, nor will it race towards a bomb. End of story." Zarif, speaking to reporters at the residence of Iran's ambassador to the United Nations in New York on Saturday, accused the U.S. of not being in compliance with the terms of the nuclear agreement, which was reached with other world powers including France and Germany and involves limiting Iran’s nuclear production in exchange for easing of economic sanctions. Zarif made similar comments in an interview that was broadcast on CBS' "Face the Nation" on Sunday. "We have put a number of options for ourselves, and those options are ready" if the Trump administration resumes sanctions, he said on the CBS program. "America never should have feared Iran producing nuclear bomb, but we will pursue, vigorously, our nuclear enrichment," if the deal is scuttled, Zarif said Saturday. Zarif said that two possible options are starting a 45-day process under the agreement, called the Joint Comprehensive Plan of Action, to resolve issues of alleged noncompliance or resuming its nuclear program, but he said those were not the only options. Trump campaigned partially on opposition to the nuclear deal, which was reached under the administration of President Barack Obama. Negotiations involved the U.S., China, Russia, France, Germany and the United Kingdom. Trump most recently has vowed to withdraw from the agreement by May 12 unless U.S., British, French and German negotiators can agree to fix what he sees as its serious flaws. When asked on Saturday if Iran could stay in the agreement and work with the Europeans and other nations, Zarif said, "I believe that’s highly unlikely." Zarif on the CBS program also discussed possible negotiations with the United States about possible release of some Americans being detained there. Zarif said U.S. "demands" are hampering dialogue. At least five Iranians, all dual-American citizens or green-card holders, have been sentenced to prison in Iran on espionage-related charges, as has Chinese-American Princeton graduate student Xiyue Wang, The Associated Press reported. "You do not engage in negotiations by exercising disrespect for a country, for its people, for its government, by openly making claims including this illusion about regime change. Then you do not leave much room for a genuine dialogue," Zarif said on CBS. The Trump administration has been critical of Iran for its support of the regime of Syrian President Bashar al-Assad, whose forces have been accused of using chemical weapons in that country's seven-year civil war. Zarif did not say whether Iran believed Assad's regime used chemical weapons, but he said "we rely on an onsite impartial investigation." A fact-finding mission team of the Organisation for the Prohibition of Chemical Weapons were able to visit a site in the Syrian city of Douma on Saturday, and took samples and will send them for analysis, the organization said. Dozens were reported killed in the April 7 attack on Douma. Zarif on Saturday said that independent tests are necessary to determine if chemical weapons were used in Syria, and if so who was responsible. He noted that Iran had chemical weapons used against it during a war with Iraq under Saddam Hussein in the 1980s. "I want to be very clear: If anybody has a red line on chemical weapons, it's us," Zarif said. Zarif, asked about Iran’s ballistic missile program and whether it would seek weapons capable of traveling farther than 2,000 kilometers (around 1,240 miles), accused the West — and particularly the United States — of "pouring billions upon billions of dollars" in military equipment to the region, and said more sophisticated weapons have been brought in by other countries "who have stated clearly that they want to bring chaos to Iranian territory." "We need measures to deter them," Zarif said. He added "neither the range nor the performance of our missiles are longer or more extensive than those that our neighbors have." France’s ministry said in March that Iran’s ballistic missile program was a major concern. In January that country's foreign minister accused Iran of not respecting part of a United Nations resolution that calls on Iran to refrain from work on ballistic missiles designed to carry nuclear warheads, Reuters reported. Zarif said Saturday that "we will not make concessions, and I do not think people can put pressure on Iran."